Well, we have some things to catch up on, don't we? As you most likely saw, I was away from the blogging world, and just the world in general, last week while I was sick. To make a long story short, it was bad. I couldn't really get out of bed, I had a high fever for the entire week, and I had to visit the doctor's office three times, where I got two shots and blood drawn. So that was fun. I'm still not feeling 100% since I have a pretty bad lingering cough and a general lack of energy, but I'm much better than I was last week. Phew. I finally started feeling better on Saturday, which was a huge relief considering it was the night of Oddball Comedy Fest. I've been talking about it for a while now, and since I bought a ticket and was looking forward to the chance to seeing some of my favorite comedians do stand-up in one place, I wasn't about it to miss it. As you might have guessed, it was absolutely worth it. I got to see nine comedians including some of my all-time favorites like Demetri Martin, Hannibal Burress, Marc Maron, Chris Hardwick, Sarah Silverman, and of course, Louis CK. It was incredible. It was amazing seeing all of them, but no one compared to Louis CK. He is a god. His set was flawless, and seeing him live was surreal. So despite the fact that I felt like dying a little bit, I would do all over again in a heartbeat. This is what I wore to the show since I wanted to wear something that felt like "me" after spending a week in pjs, but I still wanted something comfortable since I was sitting on a lawn. 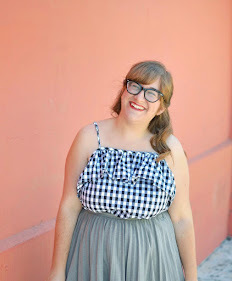 I got this Modcloth dress pretty recently, and I can't wait to dress it up a little more and style it for fall. I do have to apologize for the kind of crappy indoor photos. I still wasn't feeling great when I took them yesterday so I didn't want to stand out in the heat (I don't know what people are talking about when they say that fall has arrived), and I also didn't want to stand around and take a bunch of options. But even though I'm not crazy about these pictures or the lazy styling, I'm still excited to share this dress and my new Fifth & Mae rings. Aren't they gorgeous? Also, if you follow me on Instagram, you might have seen my failed attempt at seeing an @Midnight taping yesterday. Whitney and I got tickets to yesterday's show since a few of the guys from "The League" were on, but apparently even with tickets, it was first come, first serve, and we didn't get there early enough to make it in. We were pretty bummed, but we do get tickets for any @Midnight taping that we want with guaranteed admission, so we're hoping to find a show with even better contestants. We ended up making the most out of the day though since we were already in LA, and had a great time getting coffee at Jumpcut Cafe (a movie themed coffee shop) and then an open mic night at Meltdown Comics. Is there a better way to make up for missing the chance to see some of your favorite comedians than seeing a bunch of aspiring comedians perform to a crowd of five in the back of comic book store? I don't think so. Also, as if this post wasn't long enough, I get to see Neutral Milk Hotel in concert on Thursday. This week is the best. The night out sounds fun and that bag cracks me up. I'm so glad you feel better!!! That sounds horrible what you went through... I haven't been full on sick like that since I was little (knock on wood). You look amazing however... I love this color purple on you and those rings are to die for. Lol... on that tote bag. Cute.... I'm a Midwest Gal at heart. This dress is so cute and I am so glad that you are feeling better. It would've felt worse to miss Louie, I promise. I want yr bag! Love the color of this dress and the accessories - seriously cute bag and rings! :D Glad you're back! Love this dress! Beautiful color and cut. Glad to hear your week was so epic after a week of a lot of sickness. I love that dress's intricate cutouts! Also Im kind of dying over that tote, especially living in the Midwest and all. Im gonna have to hunt it down! Holy crap I'm jealous of your week. We seriously considered the drive over for Oddball and I would love to see a show at Meltdown- a lot of podcasters I listen to talk about that place. I'm glad you're feeling a little back to normal, sounds like you got hit pretty hard with whatever this was! Cute dress, it will be perfect for remixing! Glad to hear you're feeling better and of course, cute dress!! I'm so glad you're feeling better! It's so AWESOME that you saw all of those comedians live! Jealous! I would love to see Louis CK in person! What a cute dress! The cut-outs are really interesting! Your dress is so pretty and I am in love with the color. It's such a calming blue. Glad you are feeling better! Well, from one terrible week to the best one, I'd say you made up for that horrid sickness! Glad to see you're feeling better - and hopefully you only improve from here on out. Your rich blue dress is so gorgeous, I love the cut out neckline! Uh, maybe it's the after-sick/inside glow, but you look beautiful in these pictures! And I am forever jealous of your dress collection. Never even SEEN this one and I LOVE it.